Nahan, founded by Raja Karam Parkash in 1621 AD, is presently the district headquarter of this district. It is situated at an altitude of 932 metres from the sea level. It enjoys a pleasant climate almost throughout the year. It has several famous temples and tanks which add considerably to its attraction. It has an ancient palace just in the heart of the town which has its own importance and attracts the tourists from outside the town. It commands on all sides extensive and beautiful views. The town’s special attractions include its three lovely and lonely walks, known as the Villa Round, he Military Round and the Hospital Round, which give the tourists a very pleasant view of the surrounding areas. Just below the palace is the beautiful garden known as Ranital Bagh which is one of the most beautiful spots of the town. From the tourist point of view this town has its own importance having all modern amenities with well furnished rest houses and other private accommodation. It is believed that this is the very place where Hanuman discovered the life-restoring Sanjivini booti, which revived Lakshmana, Lord Rama’s younger brother. Ruins of an ancient town have been discovered at the nearby Dundi Devi. A wealth of herbs and beautiful alpine flora cover these Himalayan slopes. Walking through the wildlife sanctuary, one spots the spectacular monal, Himachal’s state bird, along with koklass and kaleej pheasants. The canine-toothed musk deer and the endangered Himalayan black bear inhabit the higher forests. Below the summit is the deodar-roofed, single-storeyed, square temple of Srigul with a lingam, dedicated to Shiva (Chooreshwar Mahadev). Pilgrims sing and dance at night during the Navratras fair in this ancient temple. Trekkers tread over small glaciers on their way to the wind-blown Churdhar summit, which has moderate to heavy snowfall (average of 33 feet snow). Often the Srigul temple gets buried under it. On a clear sunny day, you can be rewarded with a view of the Badrinath and Kedarnath shrines, Gangetic plains, the Sutlej river and hills of Shimla and Chakrata. Atop the Churdhar summit lie the lingams of Shiva and Kali, where once goat and sheep were sacrificed. Devotees hoist flags and make offerings here. The Jaitak hills is a historical place in the annals of Sirmour. It was here that the most important battle was fought between the British forces and the Gurkhas. Jaitak is the name applied to a peak, or rather two peaks. About 19 km to the north of Nahan, Jamta falls on the Nahan-Dadahu motorable road. An ascent of about 3 km has to be negotiated from Jamta to gain Jaitak. A hill fortress one crowned the Jaitak hill which is a steep ridge of slate and which rises above the Kayarda Dun, 30-36’ north and 77-24’ east, in the Nahan tehsil. The elevation above the sea level is about 1479 m. The fortress was constructed by Ranjor Singh Thapa, the Gurkha leader, when he attacked and sacked Nahan in about 1810. A small hamlet is the only remnant of old Jaitak. It commands a fine view of the Sain, Nahan and Dharthi hills. The famous Jaitak Khel of Kanets derives its name from this village. 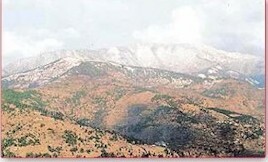 Haripur is the name applied to a mountain called Haripur Dhar. Perched on a peak of this hill like a silent sentinel, a fort was built on this range of mountain by the rulers of erstwhile Sirmour State. It was primarily meant to guard the state frontiers with the neighboring Jubbal State as there were constant boundary disputes between the two states and there was unusual encroachment into each others territory. It has fallen into disuse and the part which is still habitable is used by the Forest Department as forester’s headquarters. The fort reminds the visitor of the historical period when to hold or capture such forts used to be the chief aim of the contending hill states. Its main attraction is the wild game in its vicinity. Lying at a distance of about 106 km from Nahan it can be approached first by a regular bus service covering 40 km up to Dadahu wherefrom up to Andheri on e can go by a jeep for about 44 km. The remaining portion of about 22 km, which is under construction for a jeepable road, can be covered on foot or on ponies. The next and easier way to approach this place is from Solan via Rajgarh. Kharotiyon, a place from where the site of the fort remains about 2 km on the high hill top. 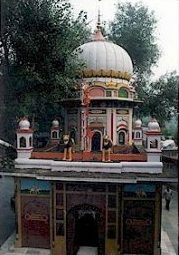 Paonta Sahib is one of the Sub-Divisional Headquarters of District Sirmour and is about 45 km. from Nahan on Shimla-Nahan-Dehra Dun road at an elevation of 397.7 metres from the sea level. This place is of great religious sanctity for the Sikhs and Hindu alike. The Yamuna flows close by on its east, turning partly to its south. So situated on the right bank of the river Yamuna, it commands a superb view of the Dun valley. Paonta main advantage is its situation. Within the town is a famous Gurdawara Poanta overlooking the Yamuna. Guru Govind Singh, the tenth Guru of the Sikhs stayed here for about 4 years from 1742 to 1745. 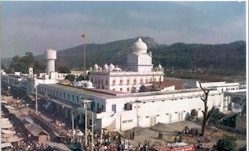 Origin of the name of Paonta Sahib is also attributed to the guru and more than one legend are still fresh in the memory of the local inhabitants. It is said that with the setting of his foot on the soil of t his place and his subsequent stay here the place was named as Paon-tika (foot-rested) subsequently corrupted to Paonta. Another version which finds mention in the Revenue Report of Majra of 1889, and perhaps more reliable and official is that while bathing in the Yamuna the illustrious guru’s foot ornament called “Paonta”, slipped and was lost for ever in the river. Hence, the place was christened as Paonta after this incident. He fought various battles against the combind forces of Rajas of Garhwal and Bilaspur. 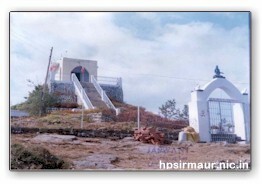 Gurudwara of Paonta Sahib is located at the victory point. This place attracts pilgrims from all over India. From tourist point of view this place has its own significance having all facilities like Tourist Bunglow, PWD Rest House, Kisan Bhawan etc. RAJGARH is located in the heart of Sirmaur district in a lush green valley. It is the biggest subdivision of Sirmaur with a population of 76,509. Rajgarh has two subdivisions, one is Rajgarh itself and the other is Sarahan, another beautiful valley of Sirmaur. The total geographical area of Rajgarh is 810 sq km and 30 per cent of the total area is under forest. The total income from various sources, which includes sale of peaches, other stone fruits and vegetables, is about Rs 32 crore. This also includes income from wood sold through the HP State Forest Corporation in Rajgarh valley, which is Rs 2 crore. Basically, the people of this area belong to Khash Rajput clan. It is said that the local people in the Pachhota Valley called Miyans were originally Rajputs from Rajasthan. During the freedom movement, the village figured in the popular Pachhota movement. It played a significant role in the liberation of states. The people of this valley are dynamic and hardworking. They are tough, stout and basically good-looking and simple people with sharp features. They are religious and God-fearing and worshippers of Lord Shiva and Goddess Durga. The local Shaya temple of Lord Shirgul, the descendant of Lord Shiva, has a mammoth following. According to a legend, Lord Shirgul had first come to Shaya village and later settled in Chur Chandani Chur-Dhar mountains at height of 12,000 feet. Renuka is the most important place of religious and tourist interest in Sirmour District. It is nearly 40 km. away from Nahan and is well linked with motorable metalled road. This place has a famous lake. Boating in Renuka lake is main attraction for the tourists visiting Renuka. This sacred oval shaped lake has a circumference of 2.4 km.. Close-by lies the Parshu Ram Lake which vaguely resemble a human figure. It is believed that Parshu Rama’s mother consecrated into water out of which this lake was formed. Towards the end of the lake are towering palm trees which offer ideal picnic spots during day time. This famous lake is visited by thousand of pilgrims every year on Kartika Ekadashi. The 1.6 Km patch between the Giri and humming camp where villagers hailing from far off places stay for a couple of days. Nightlong festivities including Kirtans are held by various groups. The place remain full capacity during the days of the fair and offer a spectacular variety of activities. As one approaches the fair ground he is greeted by a notice board put up by the Wild Life Wing of the Forest Department warning, “Hold Your Gun–Game Sanctuary Starts”. To this fair the brass idol of Parasu Rama is brought from village Jamu, his permanent abode, in a silver palki accompanied by musical instruments with great pomp and show. The deity remains in the temple for three days i.e. sudi, dashmi to dwadashi (from 10th to 12th of the bright half). The hill people pry to pujari with questions during the night when he goes into a trance and turns an oracle. He answers each and every question. These answers foretell things and, quite often, enjoin upon the questioner some offering or sacrifice to the deity of some other act as a condition precedent to the fulfilment of the favourable prophecy such as deliverance from some misery or recovery of health from some disease. On dwadashi, generally, the people offer alms after the holy dip in the Renuka lake. Sarahan, the headquarters of the tehsil and the development block. It is 1,668 m above the sea level. Located on a hill top, the place commands a panoramic view of the plains on one side and an attractive view of Choor Dhar on the other. Sarahan is about 42 km from Nahan, with which it is connected by a fine motorable road. Dagshai is about 34 km distant and Solan falls at about 52 km. The place has a Public Works Department rest-house, a dispensary, a post office, a high school, a veterinary hospital, an information center, a public call office, a police station and a poultry unit. The total are of this village is 82 hectares with a population of 778 souls. Once famous town named Sirmour was located about 16km. north-west of Paonta Sahib on the southern bank of the Giri. It was at one time the state capital known as Sirmour. Close-by lies a tank called “Sirmouri Tal” which has now almost entirely dried and is mostly under cultivation. It is believed that the word Sirmour for the district originated from this place. Amongst the ruins of this place is the store pierced with a deep hole lying on the top of a small hillock on the southern bank of the Giri. In this hole, the pole is said to had been fixed for the rope on which the juggler girl, on whose curse the Sirmour town was destroyed, crossed the Giri. A similar stone is on the other side the river. Trilokpur stands on an isolated hillock about 24 km south-west of Nahan, 77-15’ north and 30’30’ east, at an elevation of about 430 m. The place is famous for its temple of renowned goddess Bala Sundri. The temple was built by Raja Dip Parkash in 1573. A path connects it with the Nahan-Kala Amb Road at Sainwala, nearly 9.6 km below Nahan. A road runs between Kala Amb and Trilokpur for a distance of 6.4 km. A regular bus service runs from Nahan to this place via Kala Amb. There is a large pukka tank outside Trilokpur village built by Kanwar Surjan Singh in 1867 in order to remove the then obtaining scarcity of water in the village. Now, a piped water supply scheme having been completed, the tank has been taken possession of by the Fisheries Department of Himachal Pradesh for fish culture. A branch post office, an ayurvedic dispensary, a GSSS, a patwar khana, a veterinary dispensary, a sarai and a forest chowki exist there along with a forest inspection bungalow. The village is electrified. The population of the village numbers 664 and its land covers an area of 742 hectares. An important fair is held at Trilokpur twice a year i.e.in the month of Chaitra and Asvina on sudi ashtmi to chaudas (from the 8th to the 14th of the bright half). During this period the people keep on coming and going but a mammoth gathering is seen on ashtmi and chaudas viz. the first and the final days. The mela in Chaitra draws more people than that held in Asvina. The Shivalik Fossil Park, saketi is situated amidst picturesque exposures of the Shivalik hills in the Markanda Valley, Sirmour District, Himachal Pradesh. The Park has been developed by the Geological Survey of India, in collaboration with the Himachal Pradesh Government as a significant step towards preservation of Prehistoric animal sites, restoration of their natural environment and utilization of the same for scientific, educational and recreational purposes. The Park inaugurated in 1974, displays life-size models of pre-historic animals which thrived in the area 1 to 2.5 million years ago, the fossilized remains of which have been excavated from Saketi and adjacent areas. Many spectacular fossil specimens of this collection belonging to vertebrate groups have been exhibited in a small museum in the Park. In addition, the site has been developed to give a panorama of Plio-Pleistocene period (2.5 million years ago) through massive afforestation which has provided a green cover to the Park besides enhancing its beauty. The Shivalik rocks are famous all over the World for the embedded remains of various vertebrate animals and plants that flourished during a time span of 25 million years and evolved along diverging lines giving rise to the present day forms of land animals and plants. The Shivalik fossil Park, Saketi, is one of the rare gifts of nature in Shivalik hills, wherein the remains of extinct prehistoric animals have been found preserved as fossils, and is a rich geological heritage.